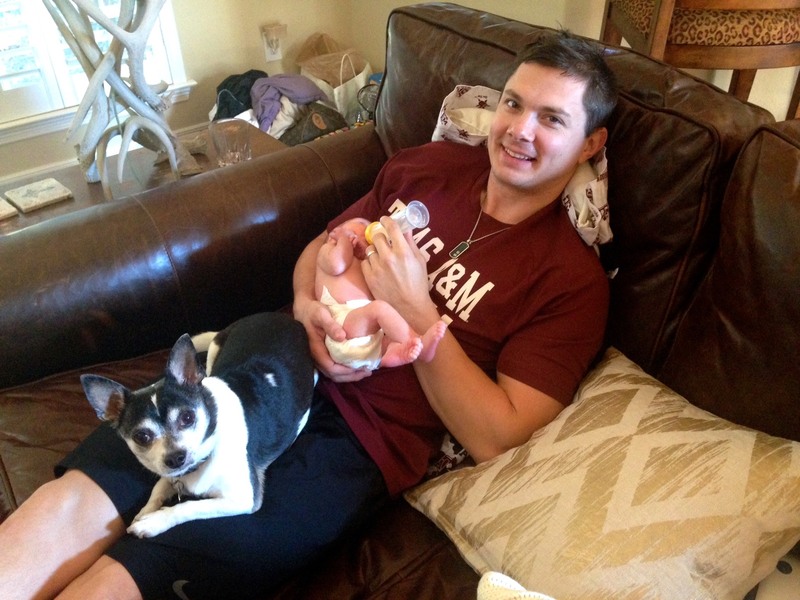 Until I met my husband, I could have cared less about football. Well, that’s not true, I went to almost every A&M football game during college, but I was never really “in to it” or knew what was going on. Football really sparked my interest just a few years ago as the Aggies went on to the SEC, Johnny Manziel become “Johnny Football”, the Aggies starting winning, and I finally got used to nothing but football on TV every Saturday and Sunday in the fall. The Super Bowl last night marked the end of football season, and I’m honestly a little sad. I’ve come to love having the game on television as background noise while I cook, and I have even come to just ENJOY watching it on the couch! Something I never would have considered doing a few years ago. Last night my parents invited us over for hotdogs and hamburgers and to watch the Super Bowl. For dessert, my mom made these super easy blondies. What’s great about them is you will more than likely already have all the items you need in your pantry! 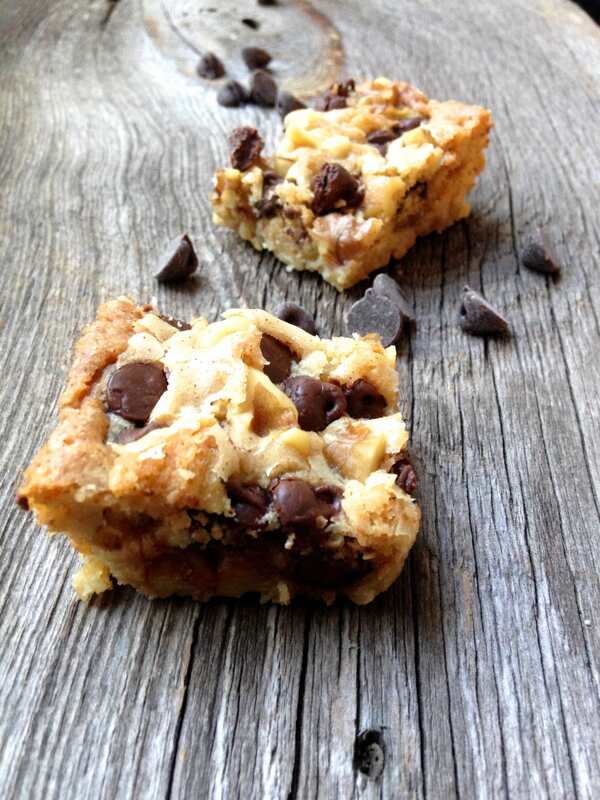 In addition to being super easy, these delicious bars are so buttery and moist. The chocolate just melts in your mouth, and the walnuts add a nice crunch. 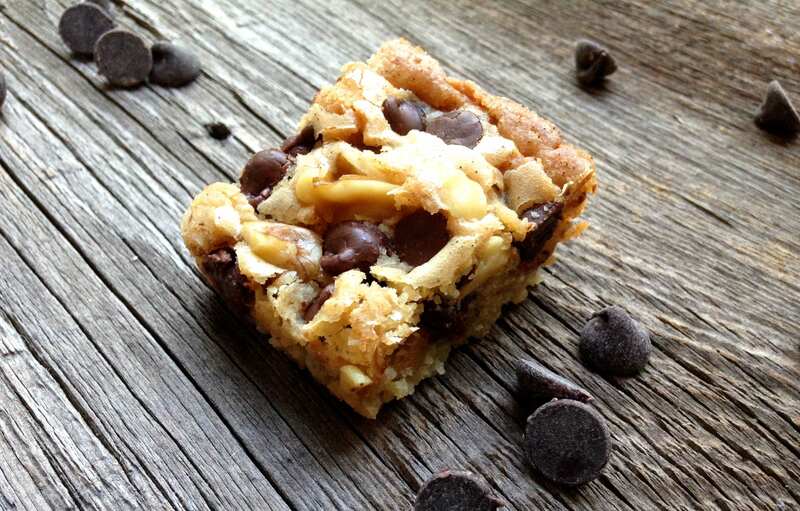 Its like eating a more buttery chocolate chip walnut cookie in a bar form! 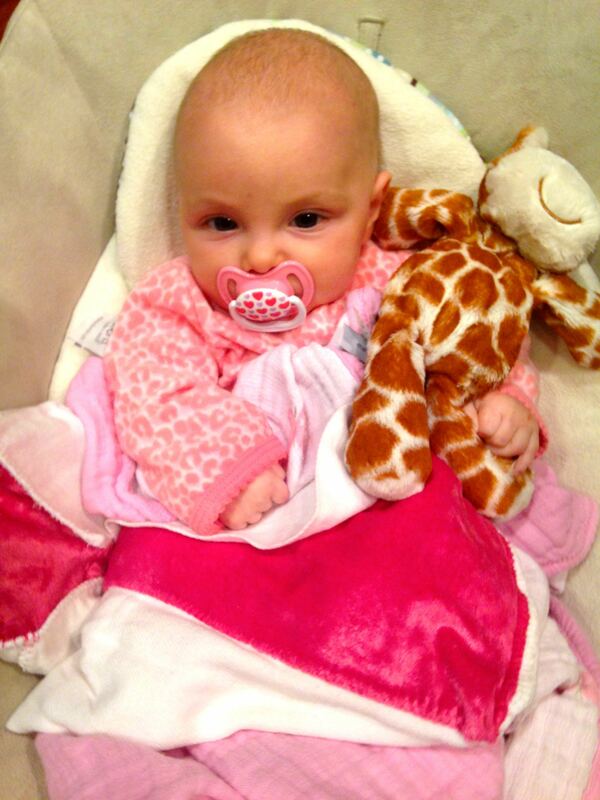 Super Bowl 49 (Seahawks vs. Patriots) was no different, as she thoroughly enjoyed the first quarter of the game laying on the floor on her cozy little pink blanket! First Super Bowl and she was loving it!!! Preheat oven to 350 degrees F. Position a rack in the lower third of the oven. Line an 8-inch square baking dish with foil. Combine the flour, baking powder, and salt in a small bowl and mix together thoroughly with a whisk or fork. Melt the butter in a small saucepan. Remove the pan from the heat and stir in the brown sugar. Use a wooden spoon to beat in the egg and vanilla. Stir in the flour mixture followed by half of the walnuts. Spread the batter into the pan. Sprinkle the remaining walnuts and the chocolate chips evenly over the top. Bake for 20 to 25 minutes, or until the nuts look toasted, the top is golden brown, and the edges have pulled away from the sides of the pan. Cool in the pan on a rack. Lift the ends of the foil and transfer to a cutting board. Use a long sharp knife to cut into squares. May be kept in an airtight container for 3 to 4 days. NUTMEG OR CINNAMON BLONDIES: Just before serving, grate a little nutmeg or cinnamon stick over the bars. 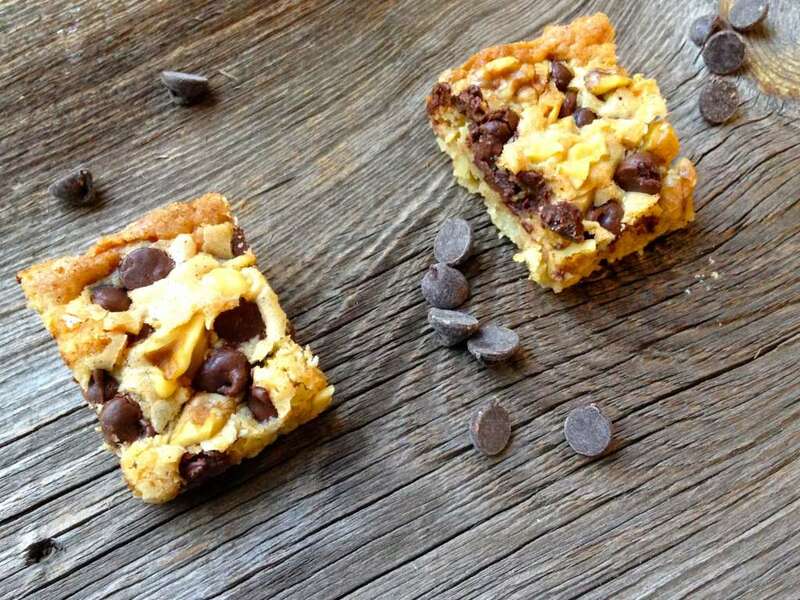 PEANUT BUTTER BLONDIES: Reduce the amount of brown sugar to ⅔ cup. Add ½ cup (3 oz) well-stirred natural peanut butter (chunky or smooth) with the brown sugar. Substitute ½ cup (2 oz) roasted salted peanuts for the walnuts. PEANUT BUTTER HAZELNUT BLONDIES: Reduce the amount of brown sugar to ⅔ cup. Add ⅓ cup (3 oz) well-stirred peanut butter (chunky or smooth) with the brown sugar. Substitute toasted skinned hazelnuts for the walnuts. Before baking, sprinkle the top very lightly with tiny pinches of flaky sea salt. 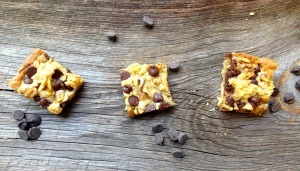 3 Responses to "Easy Blondies, Super Bowl, #equinoxmademedoit"
Shoot meant to type…… Not all chocolate ………left the n out! haha! You would have liked them. Butter butter butter!! !